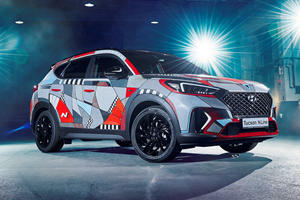 While we wouldn’t want to win the Superbowl and drive off in a Tucson just yet, the third generation of Hyundai’s compact SUV is becoming more and more compelling for family buyers. There’s a lot to like, from the high available specification to the cavernous interior, and of course, Hyundai’s mammoth drivetrain warranty that ought to last longer than you’ll own the Tucson. Three years on from the launch of this third generation Tucson, it’s a compelling offering, but faces tough competition from the likes of the Honda CR-V. For 2018 there are three engines available, with a base 164-horsepower 2.0-liter carrying over from last year, as is a 175-hp 1.6T, but new to the line-up is a 181-hp 2.4-liter. Engines are mated to either a six-speed automatic or seven-speed dual-clutch automatic with front- or all-wheel drive available. Priced from $22,550 to $30,825 it undercuts many rivals with similar specification levels. 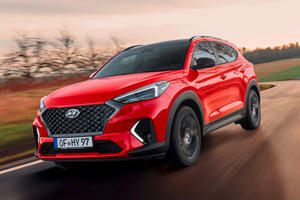 Hyundai’s popular third-generation compact SUV offering continues relatively unchanged into the 2018 model year, with only a reshuffle of trims and equipment to accompany the year change. But that’s no bad thing, as against the Mazda CX-5 and Honda CR-V the Tucson has plenty to offer, especially when families are involved in the buying process. With available front- and all-wheel drive, and three engine choices for 2018, there’s now a wider range of drivetrains to choose from, and with tech made more available across the range, Hyundai is ensuring the price of a well-equipped SUV is well within everyone’s budget. 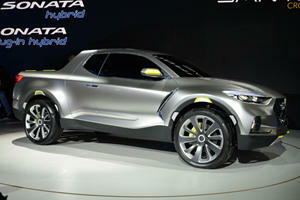 The Tucson presents a familiar face, with a largely unchanged look since it first debuted a few years ago. The hexagonal grille features up front with the flying H centered on the upper of three horizontal bars, framed either side by drawn back headlights with integrated daytime running lights from the SEL trim up. From the SEL, the Tucson also features front fog lights mounted wide on the front bumper. As you move up the trim ladder to Limited, the front gets exterior enhancements such as extra chrome trimmings on the lower front bumper. 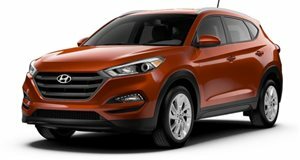 The base Tucson SE rides on 17-inch alloy wheels, as do the SEL and SEL Plus, with the upgrade to Sport, Value, and Limited trims adding 19-inch items to the mix. Body-colored side mirrors are standard on all models, while lower trims feature body-colored door handles that become chrome on higher trims. Accompanying silver additions to the front bumper on the Limited trim are chromed accents on the lower side sills, with base models featuring black sills by default. The rear of the Tucson features dual-tailpipes mounted on the right hand side of the lower bumper. The tall tailgate splits the geometrically shaped taillights,while the Limited model gets LED taillights to go with LED headlights up front. Higher trims also feature a sharkfin antenna mounted atop the tailgate. Available as an option on the Limited, adaptive xenon headlights replace the fixed LED item, while a panoramic sunroof is also available as an option. At initial launch, just two engine options were available for the 2018 Tucson. The base 2.0-liter four-cylinder, equipped to the SE, SEL, and SEL Plus derivatives boasts outputs of 164 horsepower and 151 lb-ft of torque and is paired to a six-speed automatic gearbox as standard with no option for a manual. Front-wheel drive is standard on the base model, but all-wheel drive is available on all trims. The base 2.0 is decently economical with combined estimates of 26 mpg on a route with mixed city and highway driving for the front-wheel drive model. With a 16.4-gallon fuel tank, buyers can expect approximately 427 miles of range on a tank, while the all-wheel drive’s 23 mpg over the same mixed driving route results in a range of approximately 378 miles. The Value and Limited trims are equipped with a smaller displacement 1.6-liter turbocharged four, which offers 175 hp and 195 lb-ft. But instead of a six-speed automatic, the 1.6T gets a seven-speed dual-clutch automatic. The motor is torquey and offers potent acceleration compared to the rather dull 2.0, but the gearbox is clunky and at lower speeds there’s a delay between throttle application and the gears engaging which is frustrating in traffic and when trying to maneuver around parking lots. Despite more power, the 1.6T is marginally more efficient than the base motor, with the same combined cycle yielding a 27 mpg estimate and a 443 mile range for the front-wheel drive model and a 25 mpg/410 mile range for the all-wheel drive model. Introduced mid-way through the 2018 calendar year, a new Sport model introduces a 2.4-liter naturally aspirated four-cylinder motor producing 181 hp and 175 lb-ft. The 2.4’s extra horsepower and displacement means better low down responses and eagerness than the other two engines, while the six-speed automatic is easier and smoother to use than the dual-clutch mated to the turbo motor. The 2.4 is the least efficient motor in the line-up. In front-wheel drive format, a combined estimate of 24 mpg yields a range of 394 miles, while equipping all-wheel drive drops those figures to 22 mpg and 361 miles. Despite the weaker economy figures, the 2.4 strikes the best balance between all three motors, improving on the weak outputs of the base motor and making use of a smoother gearbox than the 1.6T. But if outright performance and economy matter most, the turbo motor is a good choice. Both are better than the base engine which lacks the power and torque to get up to speed quickly, despite being okay to use about town. Simple, spacious, and comfortable are the three defining traits of the Tucson’s interior. The layout is simple and easy to understand, and the ergonomics are pretty much on point with everything within easy reach. The main touch points in the cabin where your arms and legs are in contact with the panels are well padded and generally soft-touch, and on the whole everything feels solid, but some of the materials used, particularly on the SE and SEL trim lines, feel a little cheap and tacky, especially in a segment where Honda and Mazda offer premium finishes on just about all models. The build is fine, but the feel of it is substandard. Tall doors with a step up into the cabin make it easy to climb in and out of the front seats, where standard six-way driver seat adjustment makes it easy to find a comfortable driving position, regardless of whether you’re tall or short. Forward visibility is impressive, but the small rear window and broad rear roof pillars decrease rear visibility substantially. A rearview camera is standard on all trims, but only the Limited gets rear park sensors and blind spot monitoring. The seats, along with their multi-way adjustment are firm and offer good levels of support that make them comfortable for long distance journeys, while there’s an abundance of head and legroom for the front occupants. For rear passengers, particularly those on the taller side of things, climbing in and out is a little tricky with a forward sloping door opening necessitating a duck to avoid knocking your head. But once inside, the rear of the cabin is where the Tucson decimates competitors. By sacrificing cargo volume, Hyundai has maximized the available passenger space in the rear, providing more than ample head and legroom for even adults above average height. The seats back here are a little flatter than those up front, but are still relatively comfortable, particularly over long distances, and the 60/40 split also allows minor adjustment of the seatback angle. Where Tucson competitors offer the cargo volume for road trips, they do so at the expense of occupants’ comfort. Hyundai ensures occupants are well looked after. As for infotainment, every Tucson gets a touchscreen system with easy to navigate menus. The base Tucson SE gets a five-inch screen with basic functionality incorporating Bluetooth connectivity, one USB port, auxiliary input, and six speakers. From the SEL, the screen becomes a seven-inch unit that features satellite radio functionality and is compatible with Android Auto and Apple CarPlay. The SEL Plus and Limited trims get a larger eight-inch screen with integrated navigation and an eight-speaker Infinity premium sound system. In order to give rear passengers copious legroom, Hyundai had to compromise on the amount of space available behind the rear seats. As a result, the Tucson offers nearly 10 cubic feet less cargo volume than class-leading competitors with just 31 cu. ft. available. Despite the deficit, there’s enough room for most family needs and the Tucson will gladly swallow two large suitcases with space to spare. The rear seat folds forward in a 60/40 split which unlocks more storage space - up to 61.9 cubic feet - which is still substantially less than the Honda CR-V’s 75.8 but is usable and will swallow almost anything you throw at it. On the Value and Limited models a hands-free liftgate is included with the proximity key to make loading easier with your hands full. The load sill is decently positioned in the Tucson, and a dual-level cargo floor adds extra practicality and versatility. The Tucson has never been Hyundai’s most exciting model to drive, and yet there’s nothing in particular it does badly. On the contrary, the Tucson is actually a remarkably composed and comfortable SUV to drive and ride shotgun in. The suspension errs on the slightly firmer side of things, much firmer than the Jeep Cherokee, but that ensures good body control and minimal roll around corners. Meanwhile, there’s sufficiently tuned dampers at each corner that mitigate small, rippling bumps almost entirely and absorbs the impact of larger bumps particularly well. While you’ll still feel larger bumps, the Tucson never feels uncomfortable or unsettled, even when those pesky bumps happen to arrive mid corner. There are decent levels of grip and a good contact patch is maintained with the tarmac at all times. The brakes are easy to modulate and don’t feel overassistsed as some rivals do, and emergency braking is handled without much fuss, while the supportive suspension ensures a good balance is maintained without much nose-diving under hard braking. If there’s one weak point, it’s the Tucson’s steering. It’s an electrically power-assisted system which naturally means it’s devoid of feedback and feel, and yet most of this segment has already or will be soon making the same transition. Yet the Tucson seems colder than all the others and the driver is separated from the front end tremendously. But despite this, the front end turns in keenly and the responses on the move are quick, while the steering is weighted appropriately as well. But the Tucson doesn’t feel anywhere near as involving to drive as the Mazda CX-5 which is a class leader when it comes to driving dynamics. Of notable praise is the Tucson’s impressive refinement. Even at highway speeds there’s minimal road and wind noise permeation to the cabin, while the suspension does a good job of filtering out the noises that often accompany undulating and corrugated road surfaces. Truth be told, the Tucson is probably one of the most comfortable long distance tourers in this class, and you’ll arrive as comfortably and as relaxed as you were when you started your journey. The 2018 Tucson has had no recalls issued to date, though earlier models within the same generation were recalled for a minor electrical fault that left trailer brake lights on permanently. In our time with the Tucson we encountered no issues that suggested problems further down the line, and everything seemed well put together and devoid of rattles and loose panels. J.D. Power gave the 2018 Tucson a predicted reliability score of four out of five, which is ahead of the industry average of 3 out of five. Hyundai’s extensive warranties bode well for future reliability, with a standard 5-year/60,000-mile limited warranty backed up by a 10-year/100,000-mile drivetrain warranty. The Tucson started off 2018 with five trims available, though a sixth was added midway through the year. Trims available include SE, SEL, Sport, Value, SEL Plus, and Limited. The SE is the cheapest Tucson, equipped with the 164-hp 2.0-liter motor and six-speed automatic gearbox with a base MSRP of $22,550. The SE features 17-inch alloy wheels, automatic headlights, privacy glass, a rearview camera, six-way manual driver’s seat adjustment, stain-resistant cloth upholstery, and a five-inch touchscreen system with six speakers, one USB port, a CD player, and Bluetooth connectivity and hands-free functionality. The SEL replaces last year’s SE Popular Equipment package and features LED daytime running lights, foglights, roof rails, power adjustment for the driver’s seat, heated front seats, and a seven-inch infotainment system with SiriusXM satellite radio and Android Auto/Apple CarPlay functionality. The SEL is priced from $23,800. The Sport is up next, and is the only model to feature the 181-horsepower 2.4-liter engine. It also includes 19-inch wheels, exterior styling enhancements, blind spot monitoring with rear cross-traffic alert, lane keeping assist, keyless entry with push-button start,a leather-wrapped steering wheel, dual-zone automatic climate control, and rear air vents. The recommended MSRP of the Tucson Sport is $25,150 but the extensive safety features and upgraded engine make it our pick of the range. For $26,550 you’ll find yourself behind the wheel of the Tucson Value, which gets the 175-hp turbocharged 1.6-liter motor with a seven-speed dual-clutch automatic gearbox. Also equipped are 19-inch alloys, a hands-free liftgate, a panoramic sunroof, and specialized exterior trimming. The SEL Plus is marginally more expensive at $26,700 and is similarly equipped to the Sport model, but with the SEL’s 2.0-liter engine and 17-inch alloys. It features power adjustment for the front passenger seat, a sliding front armrest, leather upholstery, upgraded door trim, Blue Link connected services, and the upgraded infotainment system with the eight-speaker Infinity stereo system and an eight-inch touchscreen with built-in navigation. Those features carry over to the top-of-the-line Tucson Limited, but the upgrade includes the turbocharged motor, eight-inch infotainment system with navigation, hands-free liftgate, LED headlights and taillights, and chrome exterior trimmings. The Limited is also the only model with an available upgrade package, the Limited Ultimate. This adds adaptive xenon headlights, lane departure warning, automatic emergency braking, rear parking sensors, a panoramic sunroof, an upgraded driver information display, ventilated front seats, and heated rear seats. Without the Ultimate package, the Tucson Limited carries a base MSRP of $29,425. All model prices mentioned above are the front-wheel drive derivatives, but all-wheel drive is available on all trims for an additional $1,400. While it may be down on cargo volume compared to class-leading rivals, the Tucson still pairs usable cargo volumes with the biggest passenger cabin of the lost, prioritizing passenger comfort. The trait carries through to the comfortable yet capable suspension setup and impressive levels of insulation from the outside environment. It’s an impressive package, particularly in higher trims that improve the interior quality, but it lacks the premium feel of the Honda CR-V or the driving enjoyment of the Mazda CX-5. But it strikes a good balance between those two rivals, and the Sport model offers a good engine to complement the rest of the package. The eye-catching design took 72 hours to paint by hand. A production version is coming but it won't look like the concept.